The new moon on 18 February 2015 falls in Aquarius decan 3. At 29°59′ Aquarius, it will also strongly affect Pisces decan 1. 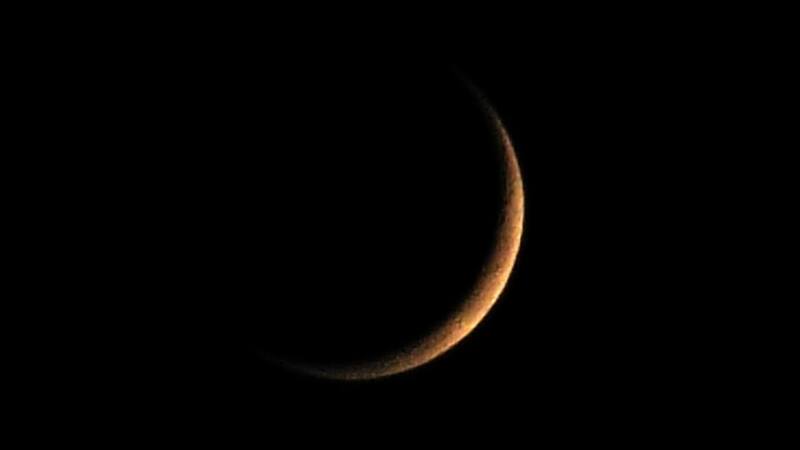 Although there are no major aspects to this new moon, it is very powerful and important for a number of reasons. This is the final new moon in an eclipse cycle which began with the October 2014 lunar eclipse. As this eclipse cycle nears completion, the energy from that previous eclipse will rise until some balance or completion is found. The theme of that October 2014 eclipse was one of emotional drama, rapid change and the rise of militants. This February 2015 new moon links directly to the next eclipse cycle, which itself is rather dramatic being on the feared fixed star Scheat. This new moon also links up with the final Uranus Pluto square, amplifying its disruptive power and extending its influence to through to the March 2015 solar eclipse. 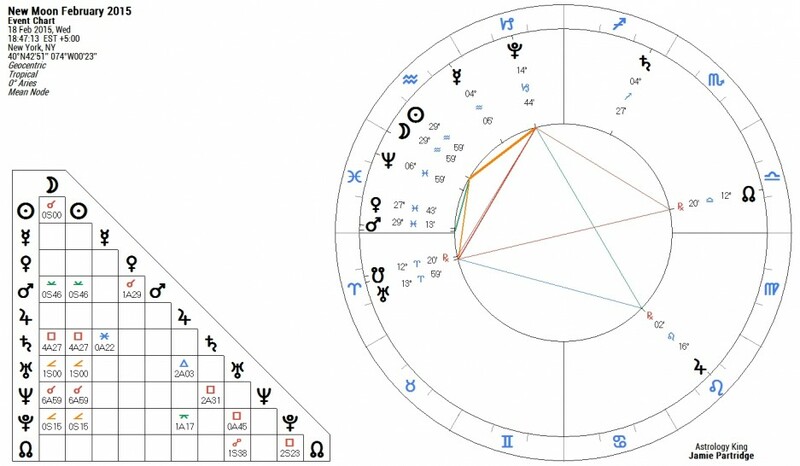 This new moon links to the next solar eclipse and Uranus square Pluto, not only in time, but also by planetary aspect. I will explain in more detail below, but what I am trying to convey is that this new moon is a stepping stone from Uranus Pluto dramatic changes, the an eclipse of danger and shocks. As mentioned, there are no major, or Ptolemaic aspects to this new moon. To ignore minor aspects in this case would lead us to miss the warning signs. The first minor aspect to the new moon is a semi-sextile to Mars. A semi-sextile is link, not at strong as a sextile, but there is a subtle transfer of energy between the planets involves. If gives a hint, or feeling of what is to come in this case. Mars, at 29* degrees Pisces, is on the exact same degree as the March 2015 solar eclipse. The star at this degree links this new moon to the coming eclipse. Beta Pegasus, or Scheat, is a star of catastrophe, associated with misfortune and extreme weather events. I studied this star during the Jupiter Uranus conjunctions at this degree in 2010 and 2011. There is a definite mundane astrology link to extreme weather, the ocean and storms. Industrial strikes and protests by the masses, as well as airplane catastrophes. At the personal level it is an omen of misfortune, hardship and drowning. For this new moon, Mars conjunct Scheat is a sign of accidents and illness. This is our first warning sign to take care, be prepared and avoid risky behaviour. Militants such as the Islamic extremists will become increasing desperate and even more violent, if that is possible. The moon phases are influential, but this terrorism is more strongly a manifestation of the seven Uranus pluto squares we are about to see off. Other results of this generational aspect are the uncertainty about the future we feel, a sense of impending doom, and the fragility of global finances. Voters are becoming increasingly impatient with political leaders, and are more willing to change sides than ever before, and opt for more extreme alternatives. When we include another minor aspect, the 45 degree semi-square, we get a direct geometric connection between this new moon and Uranus square Pluto. A semi-square represent a volatile breakup of existing conditions. The buildup of tension, frustration and anger is at a critical stage. The energy becomes so intense and unstable that someone has to give. Be prepared some shocks. it is difficult to know what is in store, given the unpredictable nature of Uranus. I would advice being conservative with money, perhaps shifting any risky assets into something more secure. We could witness an increase in the already extreme weather conditions of late. Basically, we should see this new moon as sign to be sensible, conservative and avoid risk-taking. My sun is Aquarius 25.05 and my Asc is Pisces 1.03. I’ve did feel it last Oct 2014, just recovered (well sorta). Don’t know how else this will impact me but say….bring it on. Can’t wait for the 6th Uranus – Pluto square and how I will be transformed by then. I totally surrender. Jamie, any more information for us, it will be surely appreciated. Thanks a lot for all that you do. I plan to post about Venus cpnjunct Mars which is in this new moon chart. I enjoy reading your astrological analysis and commend you on your accurate interpretation. Could you please consider writing about the conjunction of moon/venus/mars on the Aries Point (AP) on the 21st February 2015? Also what can this mean for anyone with planets on this AP in other cardinal signs? Thanks for the tip, am planning to. Hi Jamie, How can I find out fied stars in my chart or transit chart? Well, my Venus at 28.14 Pisces in the 8th, is conj. Scheat? That explains a whole bunch. Hi, I’ve been reading your articles for long time . And I can assure you that the last LE and SE on Oct 2014 was the hardest and disrutive one for me . There ‘s so many things happen during that time …. car accident -cyst rupture – meet s.o. that make my heart melt and he will be with me for at least 10++ years but we can’t have a relationship together .He came when the LE on my 8th House cusp . All Eclipse in 2015 are near my DC and vertex … I guess it could be a new beginning that heal my part. My husband has chiron on 29 degree of pisces in sixth house. What should he expect. His sun sign leo asc libra and moon scorpio? Just a quick question re: this lunation making no major aspects – do you not count the square to Saturn & loose conjunction to Neptune because they’re out-of-sign, or because they’re wider orbs than you prefer? Just curious.